Rob Derksen began building an Olympic baseball squad in early 2002. The challenge: Building a team in time for the 2004 games for Greece, a country with little connection to the game. Over the next two years, team manager Derksen scoured minor league squads for any players when even hints of Greek ancestry. By May 2004, Derksen seemed to have had enough success in finding players to talk more than simple participation. "If we put our best team on the field," Derksen told The New York Daily News then, "I would definitely put us in medal contention." Derksen, however, never made it to Athens. A veteran of two prior Olympics helming other teams, Derksen passed away that June from a heart attack. He was 44. Derksen's career in the game spanned more than two decades. He played in three pro seasons as a pitcher. He then turned to coaching, managing and scouting. He managed at single-A and coached at AA. He later served as an international scout for the Orioles. His Olympic time saw him manage Australia in 1996 and Guam in 2000, before being tabbed to construct the Greek squad for 2004. Derkson's long career in baseball began in 1982, taken by the Brewers in the 16th round of the draft out of the University of Wisconsin. His name is misspelled on his Best card as Robert Decksen. Derksen's started his playing career at single-A Beloit. He went 3-3, with a 1.79 ERA over 18 games, five starts. He moved to single-A Stockton for 1983 and then split 1984 between Beloit and Stockton, marking the extent of his regular playing career. He then turned to coaching. By 1986, he was back at Stockton as a pitching coach. He stayed there through 1989, getting activated briefly in 1987 and 1989. In 1989, the Stockton pitching coach had some fun sending hurler Steve Monson up to AA El Paso, according to the book "Stolen Season." Derksen asked Monson about a supposedly loud party the night before. Monson denied it. "Well, they said it was," Derksen told Monson, according to the book. "You've got to find a new place to live. You're going to have to live in El Paso." 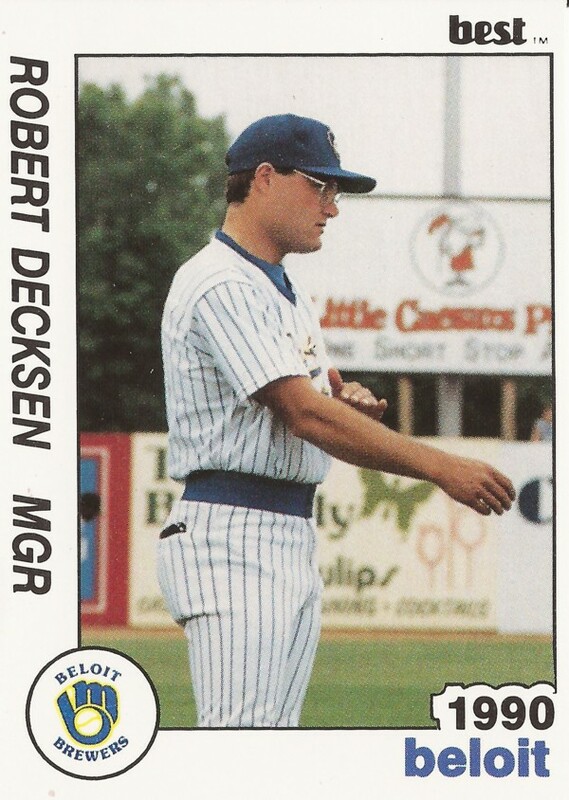 Derksen took his first managerial job in 1990 at Beloit, returning there in 1991. Derksen then moved on to El Paso himself in 1992, serving as pitching coach through 1995. He then got his start in the Olympics. By 2004, he was a scout with the Orioles and Orioles owner Peter Angelos tasked Derksen with building a Greek team for the Athens games. "We don't expect miracles," Derksen, who had no Greek heritage himself, told The Associated Press as he worked in December 2003. "But maybe we can stir some interest for the future of the sport in Greece." After his passing, his Greek team went on to compete without him. They invited his family as honored guests. After his funeral, Derksen's longtime friend Dusty Rhodes, who took over as Greek team manager, recalled Derksen to The Washington Post. "The guy was just energy," Rhodes told The Post. "When you were around him, he was either going, or thinking about going. . . . That kind of energy, that kind of enthusiasm, is what really got this off the ground."